The Costa del Sol, that's the part of Spain you go to if you want a week of sun, sand and sea right? Well of course if that is what you are after, then yes the beautiful region of Malaga in the sunny south of Spain is perfect for that. You can almost be guaranteed of sunny days everyday of your holiday, and there are plenty of beautiful sandy beaches, and a gorgeous blue ocean to swim in. While I'm certainly not knocking that kind of holiday, as sometimes a week on the beach is the perfect remedy for the stresses of modern life, this part of Spain has so much more to offer! Recently I had the privilege of being invited with +John Beckley and +Siboney Tabares King to go on an amazing media trip for a week by CLC World and GoTimeshare, for a stay in one of the beautiful CLC World resorts located in the Málaga region. As well as staying at the resort we were also able to go on a number of different amazing excursions. These were arranged by CLC World with the excursion companies that they work with. Guests who stay at the resort can book a place on any of the excursions that we tried via the resort reception. I have to be honest, before this adventure to the Costa del Sol, I had no idea that there was such variety on offer. This really was a week of new experiences, as apart from the final excursion I had never tried any of these trips before! Our week involved very little beach or relaxation, but instead a lot of exciting active adventure. On the first day we were invited to go on a Jeep Safari Tour by the brilliant Rangers Safari Tours, who have many years of experience of operating in this beautiful area. The team were taken on a wonderful adventure through the stunning countryside of Andalucía. 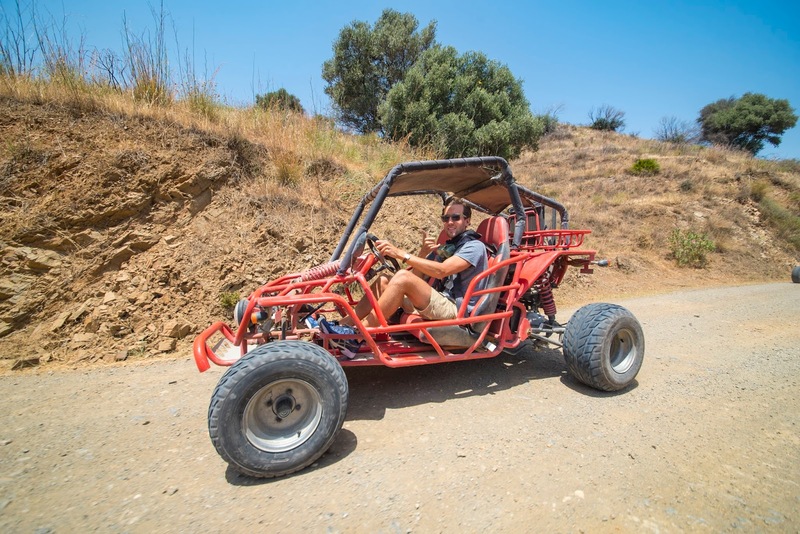 This was a safari and nature tour all rolled into one, because as well as exceptional off-road driving conditions, there was also plenty of beautiful nature to experience including orange, lemon, olive and almond groves. After such a great start to the week, could the coming days match this high standard that had been set? The answer was a resounding yes, as the next day was equally as awesome. We went on an incredible helicopter flight with World Aviation Helicopters which took us on a stunning aerial tour along the coast near Marbella, over the luxury marina of Puerto Banús. This was my first time on a helicopter, and I loved every second of it. I would 100% recommend a helicopter flight in this area! After two very different but action packed days, we had reached mid week. The excitement continued as we were off for another flight, but this time parasailing with Pirate Parasailing out of the nearby Puerto de Fuengirola. This is something I'd never done before but also thought looked fantastic whenever I'd seen it from the shore. I was slightly nervous as we were hooked onto the parasail, but as soon we took off from the boat the nerves turned to excitement. It was a huge amount of fun and gave a good boost of adrenaline :D The company are fantastic with years of experience and friendly, fun-loving staff. Next day we were back driving around the beautiful landscape of Andalucía, but now we were in control as we took the wheel of dune buggies. This was a Buggy Safari excursion with Rangers Safari Tours. This is also something I'd seen from afar and thought how fun it looked, but this time it was my turn to man the wheel. The experience was terrific and so much fun. Although of course the speeds were a lot lower, it still felt like being a rally driver speeding around off-road terrain, with mountain and forest backdrops. The company were again absolutely great and true professionals! After all that excitement during the week, the final day we had something a bit more relaxing booked. We had a spectacular sailing excursion planned with the brilliant Marbella Yacht Charters, a family run business with years of experience of providing top-quality, exclusive sailing excursions. This was a perfect end to what had been an action packed and exciting week of new experiences. We sailed from Puerto Deportivo in Marbella along the stunning Costa del Sol towards the luxury Puerto Banús. The setting, weather and ambience was sublime. Pete the captain, and Laura the other crew member were both super friendly, and great to talk to. There was relaxing music, drinks and snacks, and great conversation. We sailed into Puerto Banús to see the luxury yachts, and even had time for a refreshing swim in the warm sea water. In addition to all the outstanding excursions we also enjoyed seeing some other parts of the Málaga region including Málaga city which has an incredible life and buzz, the picturesque old town of Marbella, and the lovely Mijas located on a mountainside with beautiful views of the countryside. A big thanks to CLC World for organising all the excursions and for letting us stay at their beautiful resort. The staff, food, rooms and everything else during our stay were all second to none. Also a big thank you to all the excursion companies for providing such excellent trips and for their professionalism and friendliness.